I am the builder and wearer of this costume. I made it to wear while truck or treating with my kids. 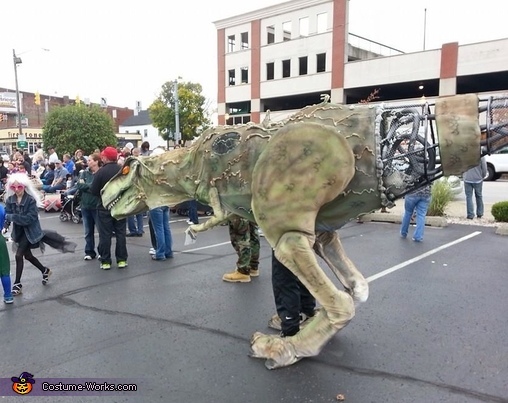 I've seen really expensive dinosaur costumes but never a cyborg one. I started out using 2x2's from the previous year's spider and then used some electrical conduant. Swiffer mop heads for the head controls, a toy car and turn signals for the eyes, patio furniture cushions for filler, and spray paint and a little airbrushing on the skin. It took me over five weeks working on it on a daily basis to complete.